If your future includes a move to Grover Beach, check out Meathead Movers! Our professionally trained student-athlete movers, moving concierge, and princess packers are prepared to get you safely moved into your new Grover Beach home. 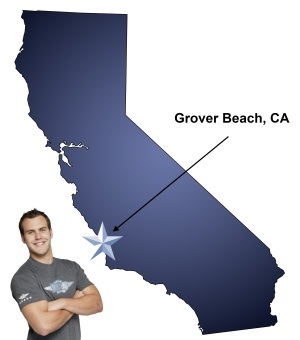 When you make your move to Grover Beach, be sure to contact Meathead Movers. No matter what type of moving service you need, our student-athlete movers are ready to handle all your moving needs. A smooth move to Grover Beach with Meathead Movers! If you are attracted to dune-filled beaches and endless outdoor activities, you may consider moving to Grover Beach, California. This community-centered beach town provides a serene environment that is ideal for families of all ages. Every year families look forward to the Stone Soup Ethnic Music Fair held at Romano Garden Park. At this event, residents relax on picnic blankets while embracing the music of different ethnicities. Our Grover Beach movers can relocate your household quickly so that you can enjoy everything this town has to offer. Thrill-seekers can rent off-road vehicles and take them to the Oceano Dunes State Vehicular Recreation Area where they can enjoy the ocean view while taking in the salt-water breeze. Outdoor enthusiasts have many locations where they can go fishing, dune hiking, and horseback riding in Grover Beach. The more sophisticated crowds can seek wine tasting events to sample the finest products of California vineyards. If all this excitement appeals to you, Meathead Movers can get your family to this ideal location quickly and efficiently. Our employees are hardworking student-athletes who value your belongings and your time. When they are not carrying your items, they jog to ensure that the job gets done quickly. You can also count on the same employees to be there on both ends of your move. With this type of efficiency, you only have to provide special instructions once, and the same movers are held accountable. Our movers do more than just load and unload boxes; they will help you set up other moving-related services as well. If you need professionals to rid your carpets of an old stain or repaint your walls, our moving concierge service will contact a company for you and set everything up. We work with only the best companies and provide recommendations based on excellent service and customer satisfaction. We can service any type of move whether it be local, long-distance, commercial or residential, small or large. We don’t have hidden charges, and our pricing is fixed for long-distance moves to guarantee no unexpected surprises. Our movers abide by your schedule, so your belongings will be delivered on the day you want rather than within a time frame. Before moving to Grover Beach, explore the Meathead differences to find out how you can get the best services for your relocation. Contact us today for a free no-obligation moving quote. Moving to Grover Beach? Here are some helpful resources. View more Grover Beach resources. Reliable! Always in contact about when you will be arriving for the move date. It appears that your employees really are proud of the services they are providing. They do a great job and are always pleasant and professional. I have heard great things about your company and will pass your name on to friends who are moving. The team that showed up were on time, efficient, and careful The only downside to the move was that the basic cost had been unnecessarily increased because the initial set up for the move had overestimated the need for manpower. Based on the description and dimensions of the item to be moved (small piano) provided during the contract discussion, it should have been reasonably obvious to someone familiar with moving planning that a 3 man crew would have been more than adequate. The move used 2 individuals with occasional help from a 3rd, but 4 people were never needed at any time during the process. This circumstance was not the fault of the crew that showed up, but it should have been apparent to the individual who took the information about the move. The employee are all very courteous, aways on time & move quick. Facilities are all very clean and well maintained.